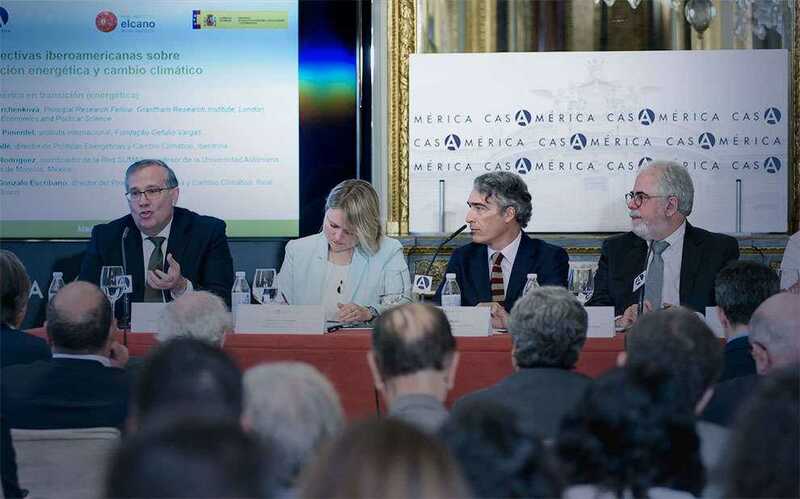 On June 18, FGV’s International Intelligence Unit (FGV NPII) participated in the event “Perspectivas iberoamericanas sobre transición energética y cambio climático” [Ibero-American perspectives on energy transition and climate change], held by the Real Instituto Elcano, in Madrid (Spain). The meeting aimed to build a cooperative vision in the fight against climate change, considering the expansion of renewable energy sources to change a global situation in which approximately 80% of the world’s energy matrix is still based on fossil fuels, and approximately 65% of electricity generation still depends on this type of fuel. Ruderico Ferraz Pimentel represented the NPII on the panel “Iberoamerica en Transición” [Ibero-America in Transition], which discussed the efficient use of renewable resources, requiring increasingly more actions that go beyond the national frontiers. “The Ibero-American cultural foundation facilitates and encourages these countries to establish links and search for paths in common. South America has a relatively comfortable situation in the electricity sector, with a strong hydroelectric share, but whose future development seems to be limited in light of its other environmental impacts, and where wind and solar power need to expand”, he said. These topics were widely discussed at the Seminar, which clearly portrayed the importance of promoting energy efficiency, electrical systems integration and Ibero-American cooperation in the technological and industrial development necessary to support renewable expansion, reduction of the greenhouse effect and its institutional implications, and interrelationship between countries.